The entrance fee for Lake Mead National Recreation Area is increasing as part of a price hike for more than a hundred national parks. National Park Service The campground at Boulder Beach in Lake Mead National Recreation Area has been renovated. The increased fees starting on June 1 will fund additional renovations. Starting June 1, fees will rise $5. It will cost $25 for a private vehicle to enter Lake Mead, $20 for a motorcycle and $15 for individuals on foot, bicycle or horseback. The fee is valid for park entrance for seven days. “Revenue from entrance fees has allowed us to address deferred maintenance and upgrade our campgrounds, extend our launch ramps and provide quality experiences for our visitors,” said Lizette Richardson, park superintendent for Lake Mead National Recreation Area. In addition to daily fee increases, the cost of an annual Lake Mead park pass will rise $5 to $45. Camping and vessel fees will remain the same. 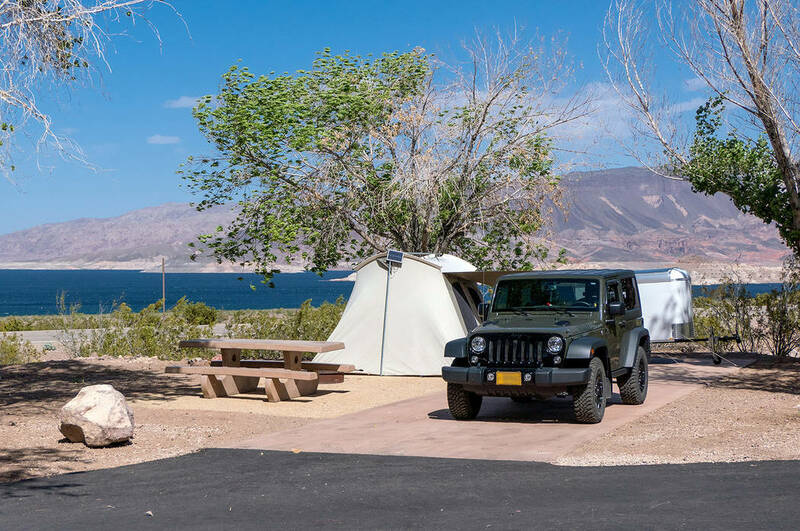 This year, Lake Mead used almost $2 million in fee revenue to improve the Boulder Beach Campground, making it RV compatible as well as replacing picnic tables, fire rings, grills and bathrooms. Several sites were also made fully accessible. According to the National Park Service, the park will continue to use the extra revenue to improve its campgrounds and launch ramps as well as enhancing the visitor experience through more amenities, resource protection and programs and services. There are 117 national parks that require a fee, all of which will increase by $5 on June 1. The 300 national parks that do not charge an entrance fee will remain free to enter. The higher rates are expected to bring in $60 million more in income. In 2016, the park system collected $199 million in entrance fees. Originally, the Park Service planned to double entrance fees during peak season for its highly visited parks, including Lake Mead. That was changed to a more modest increase for all parks annually in response to public comments. According to the National Park Service, more than 1.5 billion visitors have come to national parks in the past five years, and that increased visitation has strained park roads, bridges, campgrounds, waterlines, bathrooms and other services. In addition, it has led to a nationwide $11.6 billion deferred maintenance backlog. Las Vegas Review-Journal reporter Henry Brean contributed to this story.